Truck, truck, truck... turtle! Spot the imposter on each page, in this handsome collection of vehicles and look-alikes. Behold this artful and unusual odd-one-out board book for the youngest readers, featuring a favorite theme: transportation. Contraire masterfully creates a group of images on each spread which all belong together, and then adds one that bears some degree of resemblance, but has no business joining the rest. A toaster among buses, a donkey among motorcycles, and a bird among planes are all hiding in plain sight for the delighted toddler to giddily discover! 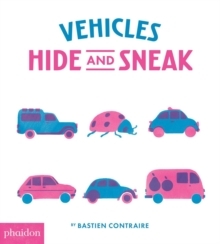 Young readers will exercise skills of categorization and concentration in finding the misplaced addition, and enjoy naming the specific vehicles as well! Features an answer key at the end.